The coastal trail connecting the five villages of the Cinque Terre is currently closed between the villages of Vernazza and Monterosso. 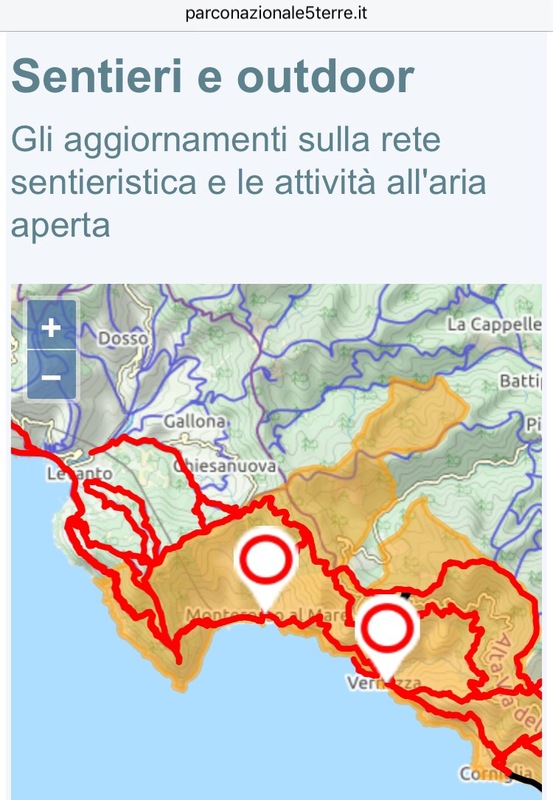 Also currently closed under the same ordinance (issued by the Comune di Monterosso) is the section of the SVA trail that connects Monterosso and Levanto (a small city just north of the Cinque Terre). A geologist (commissioned by the Cinque Terre National Park to evaluate the coastal trail following recent heavy rainfall) found a few critical points on the trail that need to be addressed for the safety of hikers. Details are actually quite vague and the few updates I’ve found seem to be void of new or pertinent information (like a timeline for works or an estimated reopening date). I’ve received word that lots of people are still hiking the coastal trail despite the signs indicating the trail is closed. Let it be known that if you do so, you will be hiking at your own risk. You could also potentially be fined for ignoring the ordinance (although I’ve yet to hear of this actually happening). You can check the official status of the Cinque Terre trails on the Cinque Terre National Park’s website (click here to link directly to their trail status page). Don’t forget that the sections of the SVA between Riomaggiore and Manarola (the Via dell’Amore) and between Manarola and Corniglia have been closed for years and are without an estimated reopening date (although there are alternate trails available). I will obviously update this post once more information is released. P.S. If you are heading to the Cinque Terre in the near future and hiking is on the agenda, don’t despair. There are plenty of beautiful, open trails that are completely free to hike (unlike the coastal SVA trail which requires a hiking pass). Follow my friends at Cinque Terre Trekking on Instagram (@cinqueterretrek) for some great tips and inspiration! I have been continuing my trail research preparing to be in CT in 1 week. I will be staying in Rio and coming up with a hike schedule to get from Rio to Fossola, Monesteroli, and Schiara – hopefully to sea on those that i can. From the National Park site, I see the path from Rio to Telegrafo is open. And the path from Sant’ Antonio to each of my destinations is open, but I can’t see an open connection from Telegrafo to Sant’ Antonio. Do you know the path there is open? Also, if all these destinations are open, should I anticipate breaking these into 2 days worth of hikes? I will be taking lots of photos so currently planning it’s at least 2 days. Please let me know your thoughts. thanks in advance! Ciao! Yes, the section of trail between Telegrafo and S. Antonio is definitely open (you’ll be walking through the Palestra nel Verde). You could easily fit all of Tramonti in one day (località Fossola, Monesteroli and Schiara) as they are all tiny. Is this section of the trail open again? I looked on the Cinque Terre website you linked and didn’t see anything about it currently being closed. I’m currently at the hospital with my son in Genoa. When he’s released and we head home I will be able to verify in person. You’re right, the National Park website doesn’t currently mention it being closed but it’s suspicious there was no press release when it reopened. I will keep you posted! P.S. I’m hoping we’ll get to go home tomorrow. Fingers crossed!